In anticipation of our don’t-miss event coming up October 16, Lemon Hound is posting excerpts and reader responses to Theory, A Sunday all month long. Check out Krystal Languell’s poignant reply here. 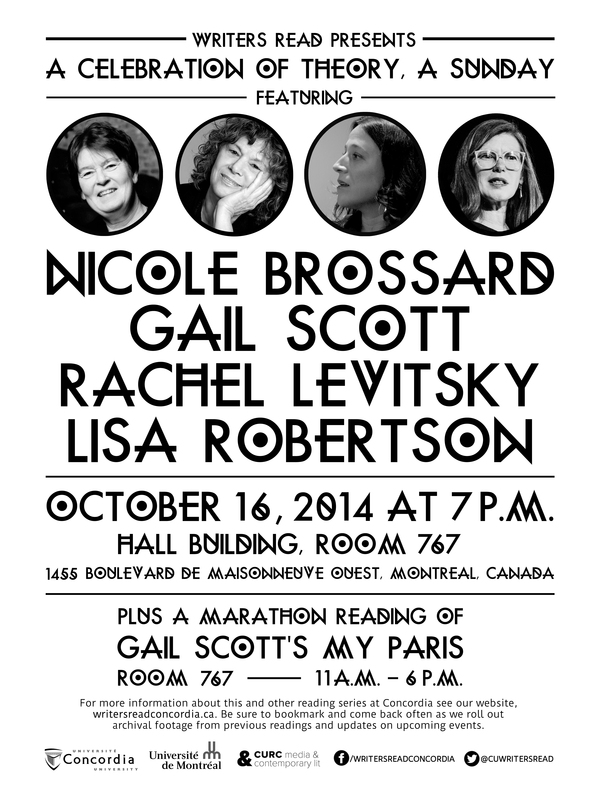 To celebrate this text, and it’s recent publication in English by Belladonna* press, Writers Read is hosting Gail Scott for a marathon reading of her novel, My Paris, from 11am to 6 pm, followed by a reading at 7 pm, where Scott will be joined by Nicole Brossard, Lisa Robertson, and Rachel Levitsky. Both events will be held at Concordia University’s Hall Building in room H- 767, 1455 de Maisonneuve West. We’ll see you there!